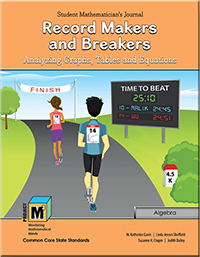 In Record Makers and Breakers, students learn about algebra as a set of concepts tied to the representation of relationships through words, equations, tables, and graphs. They also learn about algebra as a style of mathematical thinking for formalizing patterns of change. In Chapter 1, they extend their notion of variable from a letter in an equation that represents a number to a broader definition, that of a quantity that sometimes varies or changes. They learn how to identify these quantities as variables, or things that vary, in different situations. They use these dependent and independent variables to represent situations graphically, in tables, and with expressions and equations. Students also analyze changes in the situations, including the rate of change, by looking at the relationships between the variables throughout the given situation. In Chapter 2, students continue to explore a variety of world records as they use more complex quantitative data to create graphs and analyze the rate of change in more depth. They interpret the y-intercept in the context of a given situation and discuss how the steepness of the line, or slope, describes the rate of change. These experiences, discussions, and written reflections provide opportunities for advancing mathematical understanding and are an important prelude to the more formal study of algebra that students will encounter later in middle and high school. Students find that the world records we use throughout the unit to explore the concepts are engaging, and they often research additional records to deepen their understanding. Many are encouraged to attempt setting their own world records and learn to collect and analyze data as they do this.